A simple to use cloud based invoicing solution to make life easier..
Go Invoice is a community driven online invoicing solution aimed at Small-to-Medium sized businesses who are currently handwriting or using spreadsheet software to create their invoices. Businesses need to look professional, to save time and to focus on what it does best. 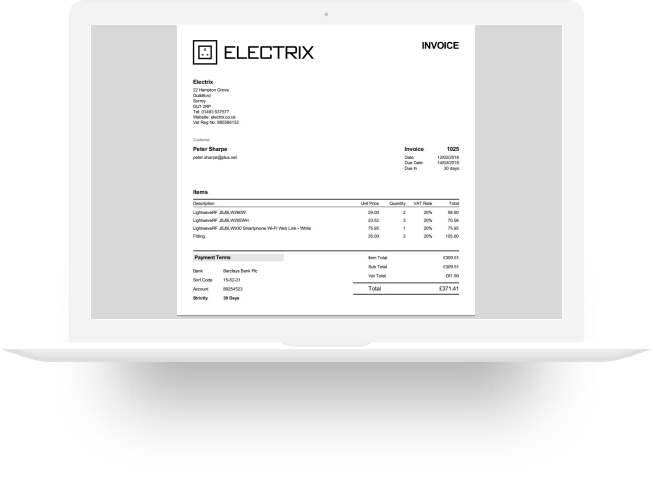 Go Invoice removes the pain of creating, sending and managing invoices, all in one convenient place. "We have now been using Go Invoice for one year and absolutely love using it as it serves all our invoicing needs. It's a very simple system which in our opinion has helped our business. The support has been superb. This is a must have invoicing software for any serious small business owner." Nigel Trickett, Trickett Welding Ltd.
Wales with company number 06078094. © 2018 Bytes Ahead Ltd. All Rights Reserved.